Here’s a cereal alternative that’s absolutely delicious! 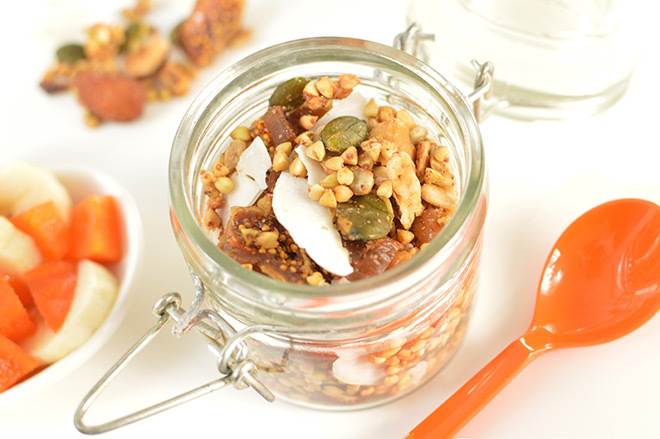 You’ll be making this buckwheat granola over and over again. 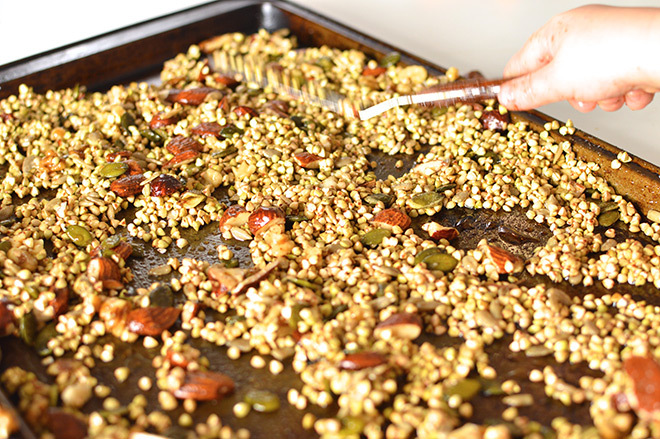 It’s gluten free and a great way to use up half used packets of nuts, seeds and dried fruit! I love the crunchy texture alongside a bowl of double thick yoghurt, or simply porridge. Kids love helping make this – weighing out the ingredients and of course testing the ingredients taste as good as they should! 2. Melt the coconut oil and mix in the maple syrup. 3. Mix the coconut oil mixture into the buckwheat and nuts until evenly coated. 4. Spread the mixture evenly over a tray and bake in the middle shelf of the oven. 5. After 5 minutes give it a shuffle and shake. Return to the oven for approximately 10 minutes until crispy and lightly golden. 6. Once cool, add dried fruit and coconut (optional to toast coconut for 2 minutes). 7. Store in an airtight container, ideally a glass jar for up to 2 weeks. Options: Any nuts or fruit can be used and add more maple syrup or honey to increase the sweetness and conversely less to reduce it. Tip: Some of this decanted into a little Consol or preserving jar makes for a really thoughtful gift. What’s your easy. healthy breakfast go-to? For more great recipes like this, sign up to our newsletter.